Is it possible to save PowerPoint to DVD disc? How to save PowerPoint to DVD disc for storing and playback? Many people would have such kind of questions. The answer is of course yes. There are multiple PowerPoint to DVD burner software tools that could help you realize this. You could learn the best solution to help you save PowerPoint presentation file onto DVD disc, and optional tools in this guide. With a professional PowerPoint to DVD burner software tool, you could easily save PowerPoint to DVD disc for any use. Leawo PowerPoint to DVD Pro is the right PowerPoint to DVD burning software you need for its high compatibility and excellent completeness in saving all elements of source PowerPoint to DVD disc. 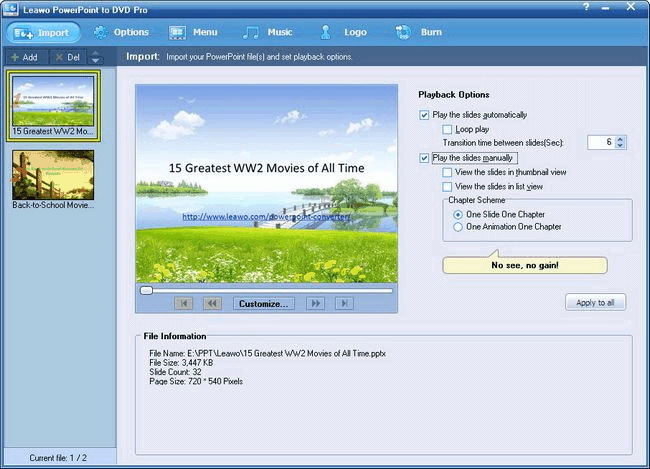 Download and install Leawo PowerPoint to DVD Pro on your computer (it’s downloadable and installable on Windows XP, Vista, 7, 8, 8.1 and 10). Then, you could follow the below steps to learn how to save a PowerPoint to a DVD disc on PC. Note: This guide is only applicable to Windows users. Mac users could turn to other solutions. Click the "Import" button on the menu bar to add source PowerPoint files to the program. You can add multiple PPT files (up to 12 PPT files at once). After adding, you could play loaded PPT files, set slide transitions, choose chapter scheme, etc. Click "Options" to choose an output option: Create Standard DVD, Convert to Video File or Create Blu-ray Disc. Since you need to save PPT to DVD disc, select "Create Standard DVD" and carry out related settings including aspect ratio, DVD TV standard, video size, etc. Insert a blank writable DVD disc into the DVD recorder drive and then select it under "Output Folder". You could even click "Advanced Settings" to customize the Blu-ray/DVD slideshow. You are able to adjust audio status in your PowerPoint file, size of slides, video quality, audio codec, Blu-ray/DVD language code, Blu-ray/DVD menu parameters, and conversion status in this step. (Optional) Click "Menu" tab to choose a preset DVD disc menu template or create your own theme. On the "Menu" interface, you could even click "Menu Creator" to design disc menu to change background, button style, caption, etc. (Optional) Click "Music" to add audio file as background music for your DVD slideshow. (Optional) Click the "Convert" button at the bottom right corner to start converting PowerPoint 2010 to video within Leawo PowerPoint to Video Pro. 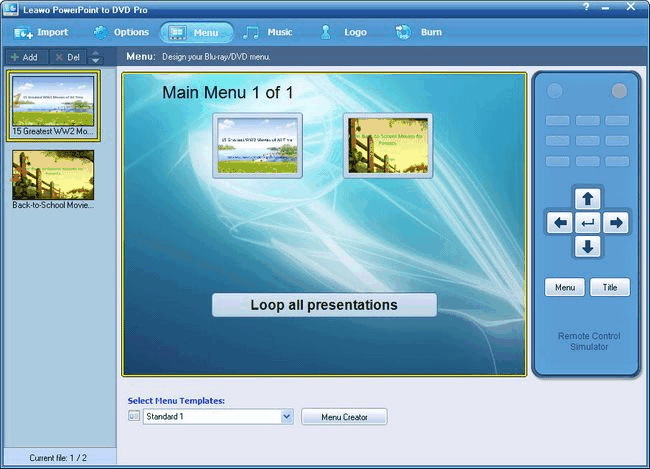 When the conversion is finished, you could then transfer the converted PowerPoint 2010 presentations to any device for playback or share online. Finally, click the "Burn" tab and then finish burning related settings. After that, click the "Start" button to start burning PowerPoint to DVD disc. If you’re looking for more effective apps to save PowerPoint to DVD disc, the below PPT to DVD burner software options might be of great help. You could check any of them to help you save PowerPoint file to DVD disc. Leawo PowerPoint to DVD Pro is a master program that helps you not only convert PowerPoint to video in 180+ formats, but also burn PowerPoint to DVD/Blu-ray movie for enjoying on TV or projector with DVD/Blu-ray player. You could use it to convert PowerPoint to video for iPod, iPad, iPhone, AppleTV, Android tablets and phones, etc. What’s more, the internal burner lets you burn PowerPoint files to DVD/Blu-ray content. The internal smart DVD menu editor creates wonderful DVD menus for manually or automatically quick navigating when playing on TV with a DVD/Blu-ray player. 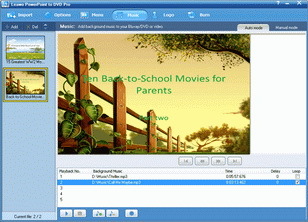 This PowerPoint to DVD converter is one of the few that support to convert PowerPoint to Blu-ray file. Other wonderful features include: internal video editor to edit and customize PowerPoint files, convert PowerPoint file to video in batch, change background music and image, etc. Windows DVD Maker might be the first choice for Windows 7 and Windows Vista users, since it is no longer available in Windows 8 and later versions. It’s a totally free PowerPoint to DVD burner software app to help you save PowerPoint to DVD disc, but you firstly have to save PowerPoint to video. Meanwhile, the other drawback is that Windows DVD Maker couldn’t be found on Microsoft. 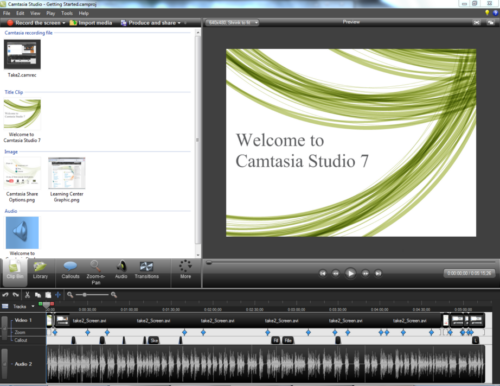 Camtasia Studio has a 30-day free trial use for you. You could firstly use Camtasia Studio to record PowerPoint presentation into video and then make use of Nero or Roxio to burn PowerPoint video to DVD disc easily. Smart PPT to DVD Converter is a very efficient tool when it comes to PPT to DVD conversions. It offers easy-to-use interface which will let you burn or convert your files with just a few clicks. 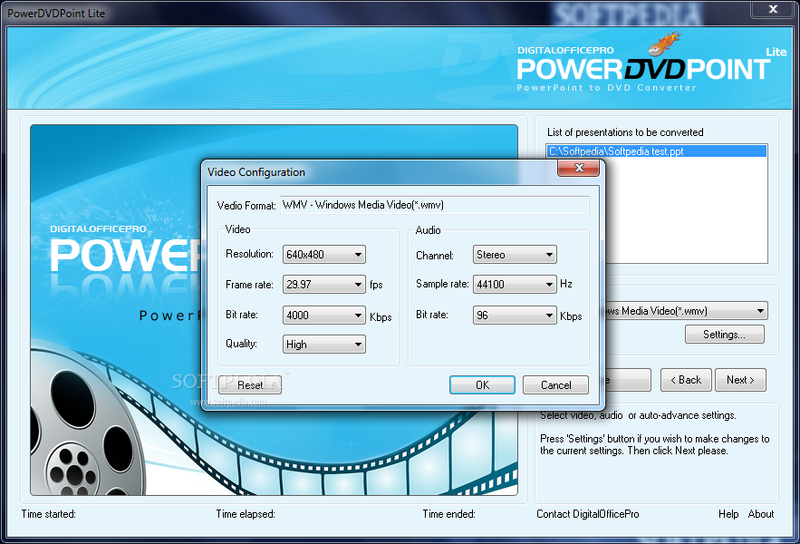 It can also convert PPT to AVI, MPEG, MP4, WMV, MOV, 3GP. Smart PPT to DVD Converter offers advanced menu which will let you control and fine tune the parameters of the output DVDs or video files. Some of its advanced features include: resolution adjustment, video and audio codec adjustment, slide advancement control, add your own narration option, frame rate and sample rate control and more. This program offers excellent audio and video quality and it will preserve all original visual and sound effects of your PPT presentation. PowerDVDPoint Lite (freeware) is a comprehensive and efficient conversion tool that helps you to easily burn your professional looking PowerPoint presentations (.pptx, .ppsx, .ppt and .pps) to DVD video format supported by your system. 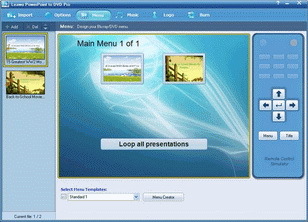 The converted output retains all the features of the original PowerPoint presentation effects like Transition, Sound, Video clips and Animations effects on slides. There is no distortion or loss of any PowerPoint effects on the output video. The converted PowerPoint presentations can be played on TV or PROJECTOR with the help of DVD remote control. The repeat and rewind control allow for unattended exhibition of your presentations. PowerDVDPoint supports all versions of Microsoft PowerPoint, with a user friendly interface that do not require any coding or multimedia editing tools.